The Center for Contemporary Art & Culture at PNCA is pleased to present NEW FEELINGS. A transformative Play and Discourse on Photography from a Diasporic Perspective. With the artists: Hassan Hajjaj, Ayana V. Jackson, Admire Kamudzengerere & Rachel Monosov, Mickalene Thomas, and Rodrigo Valenzuela. Straying from traditions of documentary photography, “New Feelings” focuses on artists exploring staged photography as a way of portraying contemporary life, identity, race struggle and history. This pastiche of voices, communities and stories work to find new landscapes and platforms to fully expand the medium of photography beyond its destine aperture. Known as the “Andy Warhol of Marrakesh,” Hassan Hajjaj thrives in a space between cultures, traditions, mediums, and artistic movements. His images vibrate with an energy unique to the contemporary clashes that emerge from a world inundated with global consumption and ever-changing shifts in style. The artist relocated to London in the early 1980s, growing up within the reggae and hip-hop club scenes that defined the underground urban environment. During his childhood, Hajjaj began to create recycled objects from everyday items. He carried this practice into his work designing the spaces of basement soul and hip-hop clubs in London, culminating in the founding of his own London boutique, Rap, in he late 1980s. Through Rap, Hajjaj sold designer streetwear, while being able to explore his own fashion and interior design, which continued to incorporate the recycled North African consumer goods that had always inspired him. Becoming introduced to photography at this time, Hajjaj found the ideal platform to merge his interest in fashion, design, music and contemporary art. The subjects of his portrait photography range from underground musicians to friends and strangers he encounters on the street. Hajjaj subverts Western preconceptions of the Arab world, confronting the consumerism that has appropriated and forever changed traditional craft production. 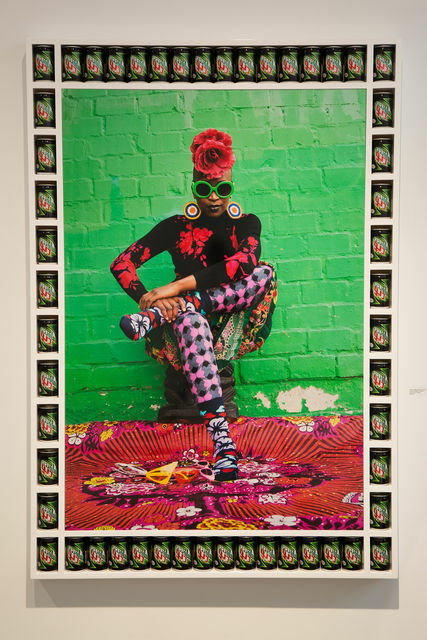 A new exhibition Hassan Hajjaj: La Caravane opens in London’s Somerset House on 5 October 2017, his first solo show in the city in seven years. Ayana V. Jackson’s work seeks to crystallize the experience of contemporary Africa and African diasporic societies. She combines honed technical skills with richly laced historical allusions to create hauntingly candid portraits that depict varying constructions of African and African-American identities. She does this through several photographic approaches ranging from reportage and portraiture to performance and studio based practice. Based between Johannesburg, New York and Paris, Jackson has exhibited her work in association with The Studio Museum in Harlem, the San Francisco Mexican Museum (USA), Museum of Contemporary African Diaspora Art (MoCADA), USA, and the Philadelphia African American Museum (USA), Gallery MOMO (Johannesburg, RSA), Galerie Baudoin Lebon, (Paris, FR), Primo Marella Gallery (Milan), Galerie Sho Contemporary (Tokyo, Japan) Mariane Ibrahim (Seattle USA). She received the 2014 New York Foundation for the Arts (NYFA) Fellowship for Photography and has received grants from the Marguerite Casey Foundation, Inter America Foundation, US State Department as well as the French Institute. Admire Kamudzengerere’s work explores identity, politics, and society, often informed by the multifaceted structural and social issues that have marked Zimbabwe’s last decade. Working in various media, he frequently reveals an unequal world in which the powerful ride roughshod over the weak. His monotype self-portraits, intense and indefinable, speak to personal struggle, self-definition, and father-son relationships, but are also pieces of a universal puzzle invoking a unifying human thread—the file rouge of community and ancestry. An artist with an international exhibition history, in 2013 Kamudzengerere completed the prestigious Rijksakademie van Beeldende Kunsten, Amsterdam program. In 2017, he mounted his first solo exhibition at Catinca Tabacaru Gallery in New York City, completed the Triangle Residency in Brooklyn, New York, represented Zimbabwe at the 57th Venice Biennial, and will be mounting a 2-artist exhibition at the National Gallery of Zimbabwe. He is a member of the CTG Collective. Bridging photography, video, performance and sculpture, Russian-born Rachel Monosov delves into cultural notions of alienation, territorial belonging, gender, and identity. Nature serves as a source for the artist’s imagery and objects, which can be interpreted as both symbolic and indexical. While her early career focused on autobiographical works steeped with a desire to grapple with her personal history, in recent years her work has reflected a rootless present rife with broader social implications. Monosov works on a project basis, each year producing several bodies of work in a variety of themes and methodologies. She constructs entire worlds around her subjects, which function pursuant to their own set of rules and laws. Together, the works speak on socio-political issues related to territory as geography and body. Monosov holds two MFAs from The Royal Academy of Fine Arts (KASK) in Ghent, Belgium (2014 / 2016). She made her first museum presentation in 2016 at the National Gallery of Zimbabwe, which was closely followed in January 2017 with a screening and performance at Museum Dhondt-Dhaenens, Belgium. Monosov is a co-founder of the CTG collective. Mickalene makes paintings, collages, photography, video, and installations that draw on art history and popular culture to create a contemporary vision of female sexuality, beauty, and power. Blurring the distinction between object and subject, concrete and abstract, real and imaginary, Thomas constructs complex portraits, landscapes, and interiors in order to examine how identity, gender, and sense of self are informed by the ways women are represented in art and popular culture. Rhinestones—the artist’s signature material and a symbol of femininity—serve as an added layer of meaning and a metaphor of artifice. Thomas uses rhinestones to shade and accentuate specific elements of each painting, while subtly confronting our assumptions about what is feminine and what defines women. Thomas has drawn inspiration from multiple artistic periods and cultural influences throughout Western art history, particularly the early modernists such as Jean-Auguste-Dominique Ingres, Pablo Picasso, Henri Matisse, Edouard Manet, and Romare Bearden. She models her figures on the classic poses and abstract settings popularized by these modern masters as a way to reclaim agency for women who have been presented as objects to be desired or subjugated. Though Thomas draws from a number of time periods and genres, her use of pattern and domestic spaces often references various periods throughout the 1960s to the 1980s. This was a time of immense social and political conflict, change, and transformation—the civil rights movement, the black is beautiful movement, and the second wave of feminism—during which many women, particularly African-Americans, rejected and redefined traditional standards of beauty. Thomas received a BFA from the Pratt Institute, Brooklyn, NY, in 2000 and an MFA from Yale University School of Art, New Haven, CT, in 2002. Valenzuela uses staged scenes and digital interventions, manipulating codes of representation to affect viewers’ perception of logic and reality. Working primarily in photography, video and installation, his imagery is rooted in the contradictory traditions of documentary and fiction, often involving narratives around immigration and the working class. In Valenzuela’s words, “Gestures of alienation and displacement are both the aesthetic and subject of much of my work.” He completed an art history degree at the University of Chile in Santiago, then moved to the United States, settling briefly in Boston before moving to Seattle. During his first decade in the US, he worked in construction and on cleaning crews while making art. Valenzuela holds an MFA at the University of Washington (2012) and an art history degree at the University of Chile, Santiago (2004). His many residencies include a recently-completed Core Fellowship at the Museum of Fine Arts, Houston; Skowhegan School of Painting and Sculpture, Maine; Bemis Center, Nebraska and the Center for Photography at Woodstock, New York. Valenzuela is the recipient of several awards, including an Artist Trust Arts Innovator Award (2014). Solo exhibitions of his work have been presented at Klowden Mann, Los Angeles; David Shelton Gallery, Houston; the Frye Art Museum, Seattle; Museo de Arte Contemporaneo, Santiago; envoy enterprises, New York and Upfor in Portland, Oregon. Valenzuela is selected for the 2016-17 Open Sessions at The Drawing Center, New York. Born in Saint-Louis, Senegal. Dieng is a multidisciplinary artist and curator exploring the symbolic and mythological power of pop culture icons through mixed media and hybrid materials. He is an Associate Professor of Painting and Drawing at the Pacific Northwest College of Art (PNCA) in Portland, Oregon. Dieng holds an MFA from the San Francisco Art Institute in Painting, a BFA in Painting from the École Nationale des Beaux-Arts, Senegal,and founded the influential Worksound Gallery in Portland OR.